Styling Magazine by Coty Farquhar - Australia: Are you a flower child? 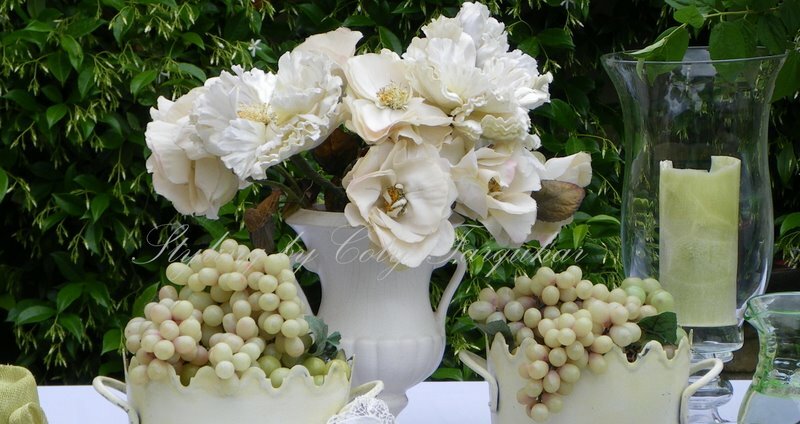 were Gardenias and the Tuberose, both strong scented and when ever I smell them they instantly remind me of her. Very early in the morning before the hot Australian sun would spoil them she would pick the new Gardenia buds still with little due drops on them and put them on the table in a vase in our home. I often took a little bunch to school for my teacher (back in the 60's) that I would have perfectly wrapped in kitchen foil, curled up perfectly to protect the petals......My early days of styling and presentation. anything that comes in the shape of a flower. You know, I also had a flower shop many years ago. and think that it is a flower shop. I just love surrounding myself with flowers. A little French doll ...her hat and dress are made from place mats. Yes....Raffia woven place mats. I found them recently and thought they would make beautiful little hats. So I dressed her up last week to sit in my shop window. tiny flowers attached to the one of the place mats, can you believe it! More flowers..
Over at Susan Herin's blog today at Between Naps on the Porch there is a giveaway from my shop. It's Susan's 140th Tablescape Thursday Party......and guess who's being featured? many different things for sale in my shop and these are just a few of the designs below. Coty, what a lovely tribute on Susan's blog. Now the rest of the world will know how wonderful your artistry is. 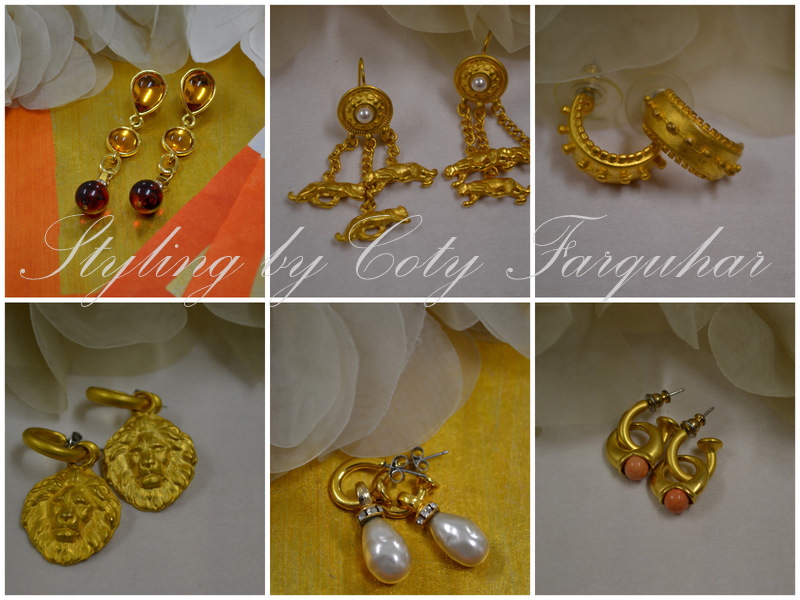 Beautiful earrings, each and every pair! thanks for the wonderful chances. Be blessed! I am so pleased Susan introduced us to your blog! The inspiration here just leaps off the page. I am your newest follower. I am a follower and am from give away at BNOP. I love the earrings and I love your blog. Coty, I had to come over from Susan's BNOTP after seeing your feature. Your photos are so beautiful, full of life and peace. Viewing them has a calming effect on ones psyche. I especially loved the photos of the children. You captured their innocence as if an invisible bystander. I also read and watched your Duhmhara post. He is unbelievably talented. I was amazed at the range of subject that was able to capture. However, the intensity never waned. Beautiful, Thanks for sharing. Thank you for offering your beautiful earrings as giveaway treasures. I have become a follower through google and facebook. I would do twitter but at my age that is about all I can keep straight. LOL. BTN on the Porch recommended your site. I now see why. Yes, you were a bee in former life. Coty... what a wonderful site! Many thanks to Susan at Between Naps for sharing. The porcelain dolls dressed in raffia place mats are lovely and unique! My southern upbringing requires that I appreciate all things beautiful... your lovely site qualifies. The opportunity to win a pair of your stunning earrings is just icing on the cake! So glad to have found your blog thru Between Naps on the Porch. I am sharing it with my daughter too! Visiting from the US. Found your blog by Between Naps on the Porch. Your work is very inspiring. Am now a subscriber! Popped in by way of Susan's blog..what a beautiful, breathtaking blog you have! I have become a follower! I came over from Susan's blog and just love the beautiful posts you have done. Now I'll look back over your blog and enjoy! Your blog is lovely. I did visit you many times before. In fact I thought I was a follower..I am now! I am excited that I may win a pair of your beautiful earrings! Thank you for having the give away. Such beautiful flowers! I LOVE your styling! The ivory/white table is so exquisite and dreamy! I have been a follower for a long time and as I read about and view your lovely pictures I feel beautiful inside and it is a sensual pleasure. Your earrings are beautiful and I would be honored to participate in your giveaway. Blessings to you today across the world from Alabama, USA. Your blog is absolutely enchanting! That beautiful horse..oh, my. I do believe I got "signed up" okay. fmparde@gmail.com. THANKS! I am a new follower from BNOP. What a beautiful blog you have! Thank you for sharing your wonderful talents.